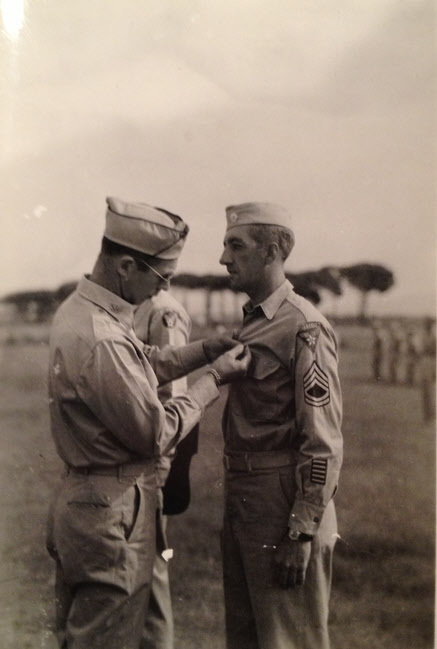 Here we see a Bronze Star being pinned onto the uniform of an unidentified Sergeant First Class of the 78th Fighter Control Squadron. Whoever he is, this is an experience man, wearing five overseas service stripes, showing that he has been abroad for two and a half years. This dates the picture to the second half of 1944 at the earliest (no earlier than May 1944, two and a half years after Pearl Harbor).